Manufacturing in China has matured significantly. However, pressure for lower cost production continues to make achieving responsible sourcing objectives challenging. This webinar explores ELEVATE’s unique in country expertise, audit and survey data insights, and trend analysis as the basis for more effective programme design. Gain insight into factory demographics including sourcing locations, sizes by sector, brand leverage and correlations with transparency and ethics.Gain insight into factory demographics including sourcing locations, sizes by sector, brand leverage and correlations with transparency and ethics. Understand wage and working hour trends over the last 3-5 years, as well as legal requirements vs. industry averages for minimum, overtime and peak hours. Learn social compliance trends including the top 10 non-compliance types by sector, closure rates and root-cause analysis. ELEVATE conducts over 12,000 audits a year, primarily in Asia in the apparel, textiles, retail, consumer goods and electronics sectors. 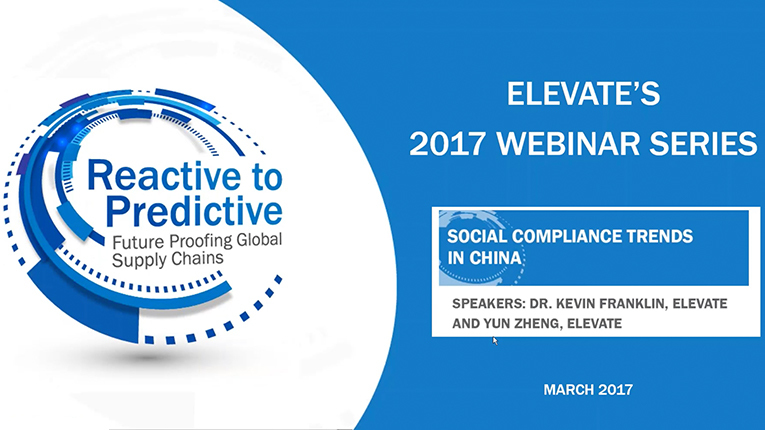 In our Social Compliance Trends in China webinar, we draw on the findings from these audits and related analysis from ELEVATE’s worker surveys, eLearning and other sources to formulate a rich picture of business risk, opportunity and impact.